On Inside The Formation we'll look at an individual player's performance and analyse their input into the game. 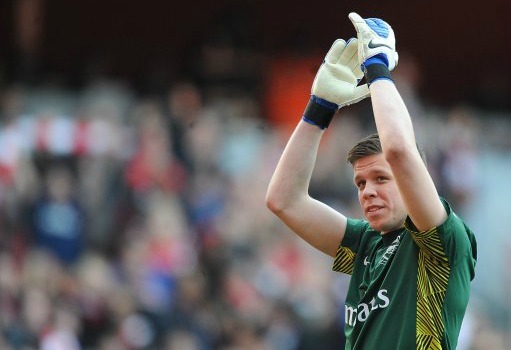 Today Joss Bennett looks at Wojciech Szczesny's performance against Liverpool. Since his debut in December 2010, Wojciech Szczesny has risen through the ranks – from a promising youngster making his name in the reserves to a popular character both in the First Team dressing room and in the stands. A fully-fledged international with eight caps for the national team to his name, Szczesny is well on his way to making the step up from simply 'promising' in the eyes of the public and neutrals. After a difficult couple of weeks for the Arsenal goalkeeper – including conceding four at the San Siro as well as a deflected shot and an unstoppable own-goal against Sunderland – Szczesny’s pleasing performance against Liverpool will have put a smile on his, and his manager’s, face. Despite his relative inexperience at just 21 years of age, Szczesny has consistently shown the bravery of someone beyond his age. Although considered naïve by some, Szczesny’s bravery when rushing off his line is arguably one of the Pole’s best attributes. Against Liverpool, Arsenal’s gamble on playing a particularly high defensive line meant Szczesny’s role developed into more of a ‘sweeper keeper’ – hovering on the edge of his box to intercept long-balls towards the dangerous Luis Suarez. During the game, Szczesny was able to deny several goal-scoring opportunities, making seven clearances overall (with five of them successful), including five (four successful) outside of his box*. Fortunately for the Arsenal ‘keeper, he wasn’t forced into doing too much else outside of his own box, with Liverpool caught offside a fairly high six times**. Despite this, Szczesny did see plenty of the ball inside the box, with Arsenal’s poor defending in the first half allowing the home side eight shots from inside the box (four of which were on target)*. Off the field, Szczesny has made himself somewhat of a fan-favourite, especially for those following him on Twitter, where he has revelled in the ‘banter’ and showed himself to be not only a player, but also a fan of the club. Szczesny’s somewhat temperamental nature has been known to get him into trouble, however. Before breaking into the side, the youngster’s ‘bad-boy’ nature (something Wenger actively tries to force out of the club) led him to openly complaining about his lack of first-team opportunities, and criticising those ahead of him – including his fellow Pole, Lukasz Fabianski. The goalkeeper, who turns 22 in April and yet has already made 42 league appearances for the club, did finally make his breakthrough after a successful loan period at Brentford and injuries to Almunia and Fabianski gave him his Premier League debut. And, after a successful debut at none other than Old Trafford, he went on to establish himself as Arsenal’s first-choice ‘keeper for the rest of the season. However, despite a confidence-boosting first season in the First-Team, Szczesny hasn’t taken his new position for granted. Instead, he has continuously worked hard to improve his game and work on his weaknesses. For example, a notable weakness in his debut at Old Trafford was his kicking, where he gave the ball away several times and didn’t get enough distance from goal-kicks. The Arsenal goalkeeper – who is by now the undisputed No. 1 in all but shirt number – does remain vulnerable to a few things, however. Long shots have been known to cause the Polish ‘keeper trouble, although the defence must arguably take a share of the blame here, and certainly will in various specific examples. But every goalkeeper – and indeed every outfield player – has their troubles. If Szzcesny can continue to improve, and to work on reducing his vulnerabilities like he has done so far, the potential is certainly there for him to make another step up and become an Arsenal great. 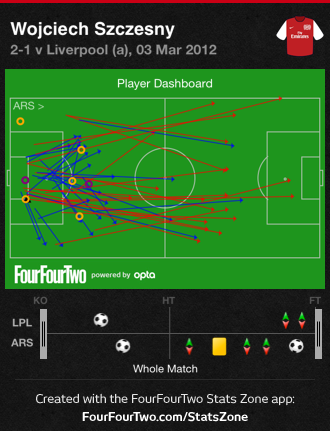 *OPTA statistics courtesy of FourFourTwo’s ‘Stats Zone’ App.